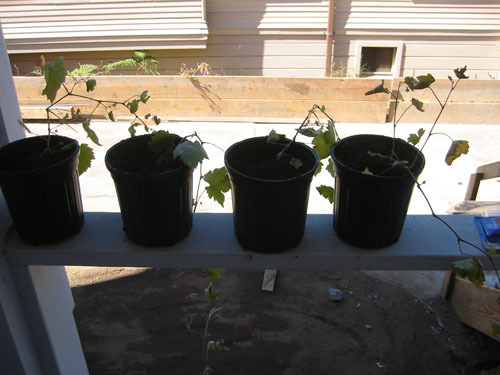 Back in April, when I planted those baby grapes, I received numerous death notices from various friends who either grow their own table grapes or even have a small wine producing effort. They'd be dead within a month, some said; others gave them as long as three months. Since that time, I have had exactly one death, and I think that one got eaten by the neighbor cat who hangs out on the side porch. I did have to move the grapes outside, because they were fostering flies and it was unbearable, and also because the damned cat was trying to eat them and getting into all sorts of trouble. Saturday afternoon, I repotted a bunch of them to one-gallon pots, where they should be fine for a while. Most of them were seriously root bound in the 4" pots, and also they'd grown together into a big mass and coiled around one another, so I had to put an end to that, too. 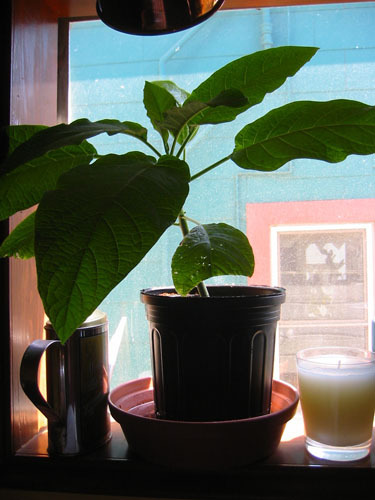 I also repotted the brugmansia cutting, which had grown to great size unnoticed in the kitchen window (I think it will have to move soon). I had to move the brug from the top of the dryer because the cat discovered it and was chewing on it (note leaf damage to lower leaves) and the hallucinogenic results had her sitting with one eye dilated and staring at her reflection in a picture glass upstairs. It was weird, so we got the brug out of her reach. On Friday night, after I got home, I potted up some callistemon cuttings and a bit of fern I'd dug up. I have three callistemons, and I'll probably only want one of them, so I have room for the inevitable moment when I forget to water the things and they keel over dead. 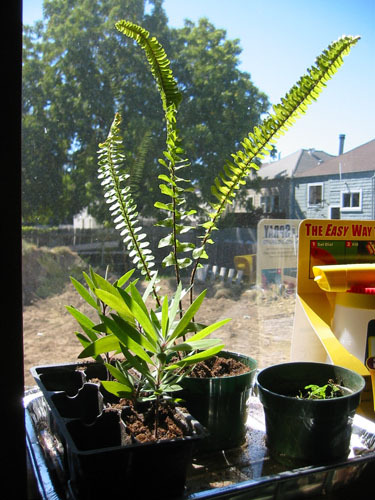 We're putting in a fern garden in the alley, so having some on hand would be a good thing. I'm also thinking of doing some spore collection and seeing what comes up. I also started a bit of an experiment. I gathered seeds from the amaryllis belladonna that our neighbor planted along the driveway, and planted them in this tray. 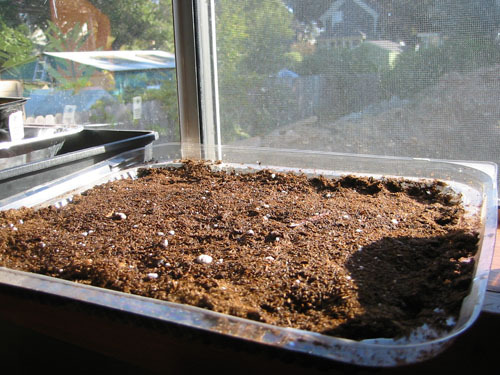 Amaryllis doesn't start easily from seed, and usually it's propagated by division of the bulbs, but I figured it would be interesting to see if they would sprout and turn into little plants. If they do, it will be at least three years before they flower, but what the heck.